The birthday bracelet that I started had a few problems. I couldn't find a clasp that I liked so I decided to make one out of silver clay. The clasp turned out well but because the silver that results when the silver clay is fired is fine silver (almost pure, unlike sterling which is 92.5% silver) the clasp was rather white in color. I want the rubber stamped design on the clasp to show so I need to oxidize it. I am waiting for the oxidizing powder to arrive, so in the meantime I suspended the construction of the original birthday bracelet and started another one. 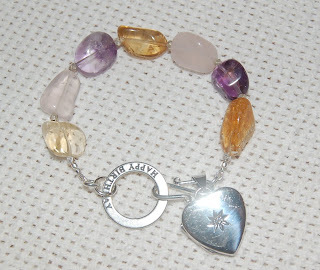 Pictured here is the bracelet which I completed just in time to wear on my birthday. I think it is appropriate for a February birthday because two of the gemstone pebbles are amethyst, which is the birthstone for this month. The other quartz pebbles are rose quartz and citrine that came on the 7" strand of beads I purchased from Ben Franklin Crafts. I wanted to incorporate the Happy Birthday sterling silver ring in the bracelet so I decided to use it as the clasp with an 'S' hook. Between the pebble beads I strung small sterling beads but amethyst beads could have been used. The stringing wire I used was a Beadalon flexible 19 strand. French buillion wire was used to cover the ends of the wire and crimps were attached with a crimping tool. For an accent I added a large heart locket but there are many other options (charms or beads) which would have worked as well. I was really happy wearing this bracelet today because of the sweet candy-like beads. In fact, I was so pleased with the results I plan to make a similar one for St. Patrick's day and write it up for a project. Oh, remember the due date for the contest is St. Patrick's Day (March 17th). Sorry, the contest is not open to Ben Franklin employees even though we know that they are super talented crafters. I hope that you are decorating your Ben Franklin Crafts reusable green shopping bag to enter in our contest. We know that YOU could be the winner of the 1st place $100 gift card prize. Read our digital newsletter to learn how to enter our craft club member contest. Remember the contest deadline is March 17th! As for me, I'm crafting a birthday present and it's for ME! After doing some major magazine reading and looking through my stash of beads (my favorite part of making jewelry except for wearing my creation), I finally decided that what I want is a bracelet with pink, grey, and brown gemstone beads. I plan to work on my birthday bracelet this weekend and I'll post a photo of the finished gift to myself. Crafting is a great way to make something personal for the special people in your life, but be sure to sometimes make something pretty for yourself too. You deserve to feel special. Who knows better than you what you want? I just had to show you this last homemade Valentine card. This one is for my teenage son.(Shhh! don't tell him.) I made this one humorous because he would hate a mushy one. Two new Sizzix die cutters made the envelope and card with cut-outs so simple. I love that the die cutters have openings into which you can place magnetic smaller die cutters to change the type and postion of the openings. 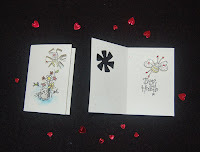 On the e nvelope I used a square die and on the card a flower shaped one. (See photo. Click to enlarge.) The Fluffles cat, bug, and word rubber stamps are from Stampendous. I decorated the card with watercolor pencils, glaze pens, and mica glitter. The words on the envelope are rub-ons from American Crafts. I put acetate behind the envelope window so that I could put confetti in it and it would be a shaker envelope. Even though it is too late for you to make this card for Valentine's Day, the Sizzix die cutters are a good investment for future gift enclosure cards and envelopes because they are basic shapes that can be made fancy with the magnetic dies. The following scone recipe is adapted from a biscuit recipe. 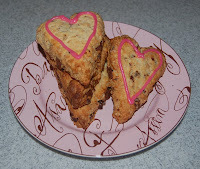 The heart shaped scones are a special breakfast treat for my family. I forgot to sprinkle on deorative sugar before baking them so I applied Wilson cookie icing after the scones were cool. I don't think the decoration will harden like royal icing so you probably should draw the heart just before serving. Preheat oven to 350 degrees. Whisk together first five dry ingredients and cut in butter until the texture is like coarse meal. Add in cherries and chocolate chips (if desired). Mix eggs, buttermilk, and extracts in a small bowl. Add the wet ingredients to the dry mixture and mix until loosely combined. On a lightly floured surface (can be done on the parchment lined baking sheet) pat the dough into a round about 3/4" thick. Cut the round into 8 wedges, spread them apart (on the parchment lined baking sheet). Shape the top of each wedge to form a heart. Brush each scone with milk and sprinkle with sugar. Bake scones for 15-20 minutes until the tops are lightly browned. Cool on a rack. 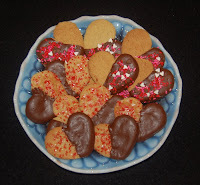 Besides the recipe, I decided to give you two humorous stories for Valentine's Day. Story #1: Recently, I tried a new face cream and was pleasantly surprised that it seemed to improve my complexion.......until I went to the eye doctor and discovered that I needed stronger glasses AND now my windows need to be cleaned! Story #2: I heard that your waist measurement should be half of your height.......so I'm working on growing 10 inches! Well, maybe the recipe is a better gift than my humor. Have a great Valentine's Day! Are you short on time and money to spend on your sweetheart? 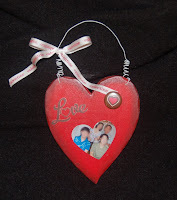 Don't despair, you still can craft this wooden heart hanging photo plaque. The wooden heart is available at Ben Franklin Crafts for $1.99 and is fully painted, stained and strung with white wire. All you have to do is tie on a bow (American Crafts grosgrain ribbon with words), rub-on the word 'Love' (Mini Marks American Crafts Valentine rub-ons) and add the sticker metal button badge (American Crafts Flair). Of course you should embellish the Valentine plaque with your favorite photo, punched or cut into a heart shape. If your honey is more of a foodie with a sweet tooth, you can always bake some cookies. I used Martha Stewart's ginger surgar cookie recipe and dipped the cookies in chocolate. Using the Wilton Chocolate Pro makes decorating these cookies so easy and the Wilton Valentine sprinkles add just the right festive touch. The Chocolate Pro sold out at the Hilo Ben Franklin Crafts store, but I was assured that more should be coming in soon. There are plans to do in store demonstrations so customers can see for themselves that this chocolate melting pot is fool-proof. I have a few more days before Feb. 14th so I'll get back to crafting and baking. Now is the time to buy your Sizzix dies because they are on sale for 20% off at Ben Franklin Crafts. I am really having fun with the extra large die cutters, the ones that make boxes and other paper f orms that can be folded into 3D shapes. These larger die cutters require the extra large cutting pads to work correctly. 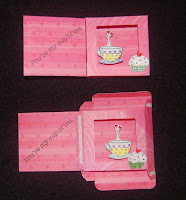 One of my favorite Sizzix die cutters is the 'shaker box' because it is a basic foldable box with a window. For Valentine's Day this box is really cute when cut out of double sided card stock (glue acetate into the window) and filled with candy. However, if you fold back the cover it can be used as a picture frame. (See photo.) You should put some foam sheets or extra thick glue dots in the back of the photo since the box is fairly deep or you can put several photos in the box to make it a changable photo frame. Years ago I made diorama greeting cards which could be mailed flat. Assembling the the box part of the card was always tedious, so I was excited when I figured out that I could use the Sizzix shaker box to make diorama cards. All the rubber stamp designs used on the card in the photo are from the Hero Arts 'So Sweet' clear stamp set. I colored the designs with glaze pens, watercolor pencils, and glitter. A thick glue dot was placed behind the teacup to give it more dimension. If you intend to mail the card, you should not assemble the card but apply Merikan tape to all the flaps so that the recipient of the card can assemble the card after it arrives in the mail. (See photo.) As a small gift, you could place a tea bag packet in the box and use it as a tea party favor. In fact, this box done in wedding colors, printed with name/date, and tied with a gauzy bow would be an easy and inexpensive way to make wedding or shower favors. When you walk into the Hilo Ben Franklin Crafts store you know it's spring because there are butterflies everywhere. The sparkling, sequined butterflies are in the form of picks, sprays, and other decorative items. I decided that they would make the perfect package topper for the birthday gift I was sending to my sister. (See photo.) The wrapping paper is the one of the inexpensive single sheets from Japan and the ribbon came from a huge roll of Heiko ribbon. The wrapping paper and ribbon are good buys for the budget-minded shopper. 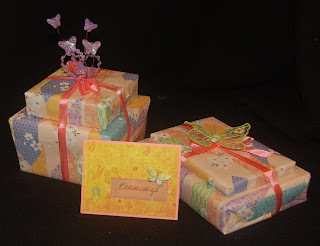 Because I was butterfly happy, I decided to look for a rubber stamp to make a birthday card to match the gift wrap. I found the perfect background stamp from Hero Arts (Butterflies and Flowers). Although you might not be able to see from the photo, I stamped and embossed the design on a printed sheet from the K. and Co. 'Mira' Specialty Paper stack. This pack of paper includes some glittered and foiled paper but the one that I liked was plain so I embossed it with glitter gold embossing powder. 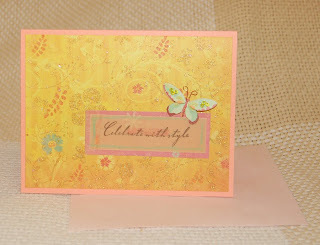 I really like the subtle way that the embossed floral stamp design glitters on the floral print of the paper. The dimensional butterfly used on the card is a sticker from K. and Co. After I applied it to the card, I noticed that somehow a decorative bead on the wing had fallen off. I decided to remove the bead on the other wing because I didn't have a matching one. Unfortunately, some of the paper wing ripped off when I took off the bead. Aargh! In desperation I colored in the wing with a color pencil and glued on more beads to cover the flaw. Sometimes mistakes yield a better outcome. Another happy mistake happened when I used a non-vellum tape to adhere the vellum paper with the stamped words. Of course the tape showed.....arrgh!...but I saved the card by drawing over the tape lines with a color pencil to make the mistake look like I intended to have a sketchy border around the words. I was surprised that despite the boo-boos, the card was still very attractive. Ben Franklin Crafts now has lots of spring and Easter items. I especially love the Easter baking supplies from Wilton (candy sprinkles, cake pans, etc.) and the cute packaging for treats. The Valentine items are still in stock, but I understand that they are selling well, so if you haven't prepared for February 14th you'll need to hurry because you only have a few more days. I've always wanted a chocolate melting machine that would keep chocolate tempered so that I could make candies. Most of the machines I've seen ranged in price from $100 to $300+. Not knowing if I would enjoy chocolate making I've been reluctant to spend the money on a professsional machine. After Christmas Donna at Hilo Ben Franklin Crafts showed me the Wilton Chocolate Pro. This inexpensive machine is supposed to allow the home cook to keep real chocolate at an even temperature for candy making or fruit dipping. Because of the low cost, I was doubtful that it would work as advertised. However, I was very, very pleased with the results of my first attempt at chocolate candy making without using the microwave. The photo shows the gift of chocolate dipped crystalized ginger and apricots that I am sending to my sister for her birthday. Since Donna was the one who showed me the wonderful Wilton Chocolate pro, she will receive the extra candy. Thanks Donna! This machine is probably the best thing I've bought recently.....and I shop alot! Next I'm going to try molded candies.